If Manchester United fans are happy to pay money for a ticket, Jose Mourinho is happy for them to vent their frustrations however they wish. Jose Mourinho has no issue with Manchester United fans voicing their frustration after ripples of irritation comprised the soundtrack to Saturday`s 1-0 win over Tottenham. Though Anthony Martial`s late winner brought Old Trafford to its feet and secured a victory that moves United clear in second place, the 80 minutes proved tense and terse fare. 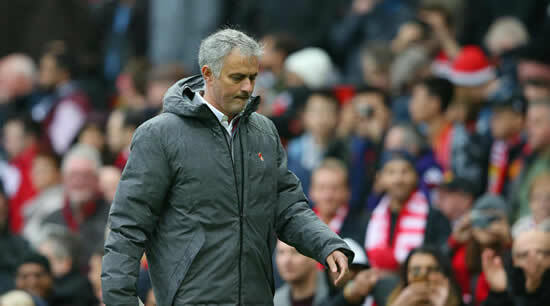 After insipid attacking displays at Liverpool and Huddersfield Town saw United drop five points off Manchester City`s table-topping pace, a response was required against Spurs, but Mourinho once again battened down the hatches. The decision to withdraw Marcus Rashford in the second half was met with jeers, but his replacement, Martial, would prove to be the match-winner and Mourinho was not interested in picking a fight with his fans afterwards. "They pay the ticket, they can do what they want," Mourinho told reporters. "They can boo a player that doesn`t deserve to be booed, they can boo a player that is working like an animal because the game is not going in his direction. "They can boo, they paid their ticket. They can do what they want, they can boo the manager. They can do what they want, there is no problem for me. "Enjoy football. Don`t be speaking all the time so much anticipating scenarios, trying to put pressure on people. Relax, enjoy football." United`s sudden loss of creativity had been put down by some onlookers to the absence of Paul Pogba, out since September 12 with a hamstring injury. Mourinho remains in the dark as to when the France international will return, but briefly defended his side`s record without their record signing. "Again, I have no idea [when Pogba will return]. Honestly, I have no idea," Mourinho said. "Marcos Rojo is working with me with certain conditions so I would expect Marcos Rojo to be ready to play after the international break. I can predict that because he`s training with me. Paul, I have no idea. "We won every match [without Pogba] except one, two? So... not bad."